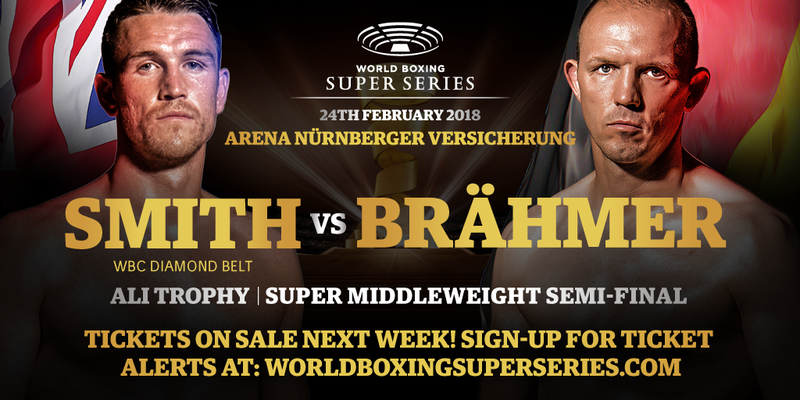 The Ali Trophy semi-final clash in the super middleweight edition of the World Boxing Super Series between Callum Smith (23-0, 17 KOs) and Juergen Braehmer (49-3, 35 KOs) takes place at the Arena Nürnberger Versicherung, Germany on February 24. Both 27-year-old Smith and 39-year-old Braehmer appeared as serious contenders to win the Muhammad Trophy with their quarter-final performances last year. Britain’s Smith claimed a 116-112, 117-110, 117-111 victory on the judges’ cards and advanced to the semi-final after a thrilling match against Sweden’s Erik Skoglund at the Echo Arena in Liverpool. Germany’s Braehmer proved age is just a number when he beat American hope Rob Brant in dominant fashion at the Kongresshalle in Schwerin with the judges scoring it 119-109, 118-110 and 116-112 in favour of the former light heavyweight world titleholder. “I am looking forward to the fight,” said 39-year-old Juergen Braehmer. Tickets for the Ali Trophy semi-final bout Smith vs. Braehmer will go on sale next week. Fans are asked to sign-up for ticket alerts at worldboxingsuperseries.com to receive the Ticket Link directly to their inbox, and avoid disappointment.